Welcome (or welcome back!) to the bustling city of Machi Koro. You've just been elected Mayor. Congrats! Unfortunately the citizens of Machi Koro have big demands: jobs, a them park, a couple of cheese factories and maybe even a radio tower. The fast-paced, light hearted card game for up to 5 players. You are competing for mines, cafes, the legendary cheese factories and more as you race to construct all of your major landmarks. Amp up the strategy with 10 new establishments, 1 new starting establishment and 2 new landmarks. It also adds new rules that ensure no 2 games will ever be the same! Machi Koro: Millionaire's Row Expansion. Add a dusting of glitz with 13 new establishment cards including vineyards, wineries, fine French restaurants, Member's Only clubs and other ornamentations. 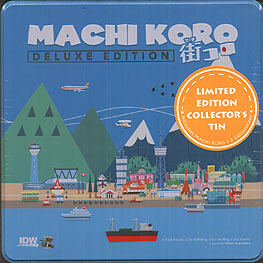 You can play Machi Koro with either expansion or combine everything with each other for a Tokyo-sized city! Or you can keep it simple with good ol' Machi Koro, depending on your audience and your mood; the choice is yours. After all, you ARE the mayor!